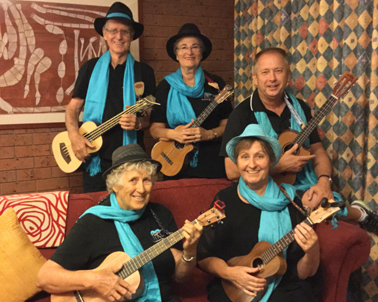 A Hint of Rosemary made their debut performance at The Australian Ukulele Show’s 2016 Australian Day concert, and performed at the 2017 Sunshine Coast uke festival, Tropulele. This small group (Ian Phillips, Rod Iffinger, Rosemary Starr, Peter Sercombe, Sue Sercombe, Clare Gornall and Sharon Mitchell) originated as a break-off group from “The CAGE”, which has about 40 members. It’s their desire to perform as often as possible to increase our confidence and love in music. They love to create harmony, and demonstrate to other willing performers that anything is possible when your heart and determination are set. The group performs a variety of songs based mainly from the 60’s repertoire, but not exclusively so. Arranging techniques that can be easily included to ensure all players are equal regardless of ability. The 5 areas of focus will be: Structure, Strumming, Singing & Harmony, Fingerpicking and the use of additional instruments for colour.